Let’s face it, not everyone has a naturally attractive smile. When you combine genetics with environmental factors, lifestyle habits, or trauma, it is easy to feel insecure about your teeth. You do not need to live with the results. You can get a picture-perfect smile using an effective and minimally invasive solution. 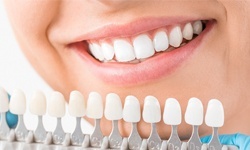 Cosmetic bonding in Greenfield improves the size, shape, color, and proportion of your teeth. We create the customized treatment plan you need to love your smile. Cosmetic (direct) bonding has become one of the most preferred elective dental treatments because it provides noticeable results without requiring a lengthy procedure. Now, many patients prefer it as an alternative to veneers because it does not require you to permanently alter your teeth. A special resin material, which is like putty, is customized to match the color of your enamel. This allows it to blend in with your teeth, so no one will notice it is there. It is sculpted into the desired shape to cover your cosmetic flaws to enhance the appearance of your teeth. What Can Cosmetic Bonding Fix? Dark tooth discoloration or stains. You first need a consultation with your dentist in Greenfield to ensure you are a candidate for cosmetic bonding and to create a customized treatment plan. You are scheduled for your treatment, which can often be completed in one day; however, if you are treating multiple teeth, you may need more than one appointment. To transform your smile, your teeth are cleaned, and a weak acid is applied to them to open the pores in your enamel. This encourages a secure bond between the resin and your teeth. A color guide is used to find the perfect shade for your new smile before placing the putty-like substance on your teeth. It is sculpted into the desired shaped and a special blue light is used to quickly harden it. Your teeth are smoothed and polished, so you can walk out of our office with your dream smile. Brush your teeth twice a day with a soft-bristled toothbrush and fluoride toothpaste. Avoid anything thing that can lead to stains and discoloration, like smoking, coffee, or tea. Do not use your teeth as tools to open packages. Do not chew on inedible objects, like pens or your fingernails. You can get the smile you have always wanted without an invasive treatment. Contact our office today to see if cosmetic bonding is right for you.